Botanical name: Michelia alba DC. Yu Lan Hua is a humble looking flower which can release powerful fragrance. Yu Lan tree thrives in sub-tropical climates, common in Guang Dong, Yunnan and parts of India. When I was a little kid, I often saw ladies/girls selling Yu Lan flowers in a little basket at street corners after dark, they often had a couple flowers slipped behind their ears or clipped among hairs. Cultural revolution abolished anything luxury, perfume was definitely a no no. Yu lan flower became a substitute of perfume, its fragrance is attractive and refreshing. Politic can dampen human spirit, but spirit will survive and revive then thrive! Some times I wonder if technology was invented to complicate human life in some aspects. It's natural, organic and easy to put a couple of Yu Lan flowers in hair as it's decorative and smells attractive. Instead we go through a massive process to extract essential oils from tons flowers to produce small amount of perfume, tons money to package, then cost even more to market the product, test with animals, excessive insurance coverage to cover unnecessarily law suits, medical bills for allergy, etc.. I wonder.... I just wonder... It must be financial driven, job creation, blah blah blah. Yu Lan trees can be as tall as 6 to 8 meters. Pictured is a young tree. 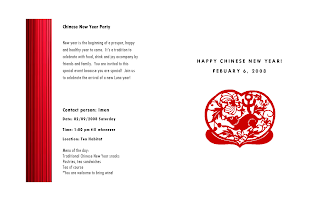 Invitation to Chinese New Year party! LATA members, local tea nerds and out of town tea nerds who happen to be in town, you are all invited to come to my party! New Year holds the most significant meaning to me and my family. It's time for celebration, family gathering and drink tons of tea to wash down the large amount of food. Click on second picture for details. I want to talk about blending tea briefly. Here we are not talking about herbs/flowers/spices blended teas like the western herbal blends. 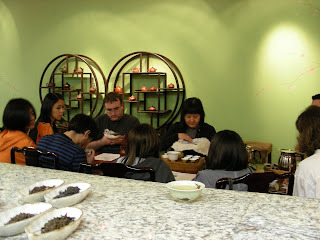 I am talking about blended oolong tea, black tea and pu-erh tea. Many tea drinkers are at constant quest of single estate teas, believe the pure breeds are the best. While this may be true for some, but not all. First reason is a common commercial practice, similar to wine/spirit making. Ingredients are different in taste for each year, grapes can be sour this year and sweet the next. Using the same method to make wine will result in different taste each year, however consumers had it last year and liked it would like to buy something just like what they had last year, hence wine makers blend different batches to match the flavor. Same reason for blended whiskey, it tastes very similar no mater when it's made. However single malt whiskeys have wide range of flavors. That's the difference in consumers preference, burger king burgers vs home made burgers. Burger king's won't be outstanding, but it's not bad. Home made burgers can be excellent but may not be the same every time. Teas are blended to meet market needs year after year with some what consistent flavors. Earl Grey drinkers will not like their earl grey taste like Lapseng Souchong the next time they order a tea bag. 2nd reason for blending tea is to create new flavors. 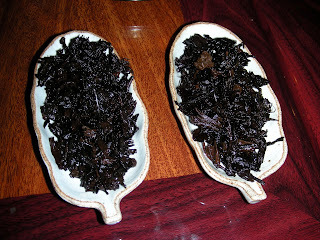 Pu-erh teas are blended mostly, using leaves from different mountains and regions, leaves from different seasons, or any combinations of leaves. One region gives smooth texture, an other region gives more bite, one can be too astringent, an other can be too bitter, by combining all the leaves, the finished product will be more complex with multiple layers of flavor. Wuyi tea farmers also blend leaves frequently. Da Hong Pao commercial products are mostly blended, and China agriculture department approved of such marketing scheme. Commercial Dan Congs can be blended as well. Other than the top 10 fragrance DCs, there are many varietals do not have a signature fragrance, hence mixing them with other aromatic DCs will give the new blend a whole new life. The strength of one can make up the weakness of another. An ever lasting Chinese philosophy. 3rd reason for blending tea is use what you have on hand sufficiently. This type of practice can be seen with old bushes of Dan Cong. Due to small productions of averaging only 3 lbs per tree, for those produces only a lb or less, farmers combine a few trees of similar flavor into one batch. If age of the combined trees vary by far, the older tree will contribute an old bush YUN, while the younger tree will contribute higher note of fragrance. Blending is an art can be refined only with experience. US is a society of speed, fast cars, fast high ways, fast Internet, fast service from food to drive through wedding, how can tea be omitted from the fast lane?! No one has the patience to sit down and wait a couple minutes for tea to brew, hot tea does not cool fast enough for instant drinking so the invention of iced tea. My customers ask me for ice cubes. Machines are made to brew hot and iced teas with preset time and temperature. #4 in the world, US consumption of tea is more than I thought it would be. One must think there is a tea culture here. Well, if there was one, it must be tea bag and iced tea culture. It's the physical presence of tea without the spirit. I am stressed out just thinking of waiting in line for a cup of hot tea at Starbucks. The term Cha Yun4 has troubled me for a few years, especially when I was in the stage of trying many teas I had not had or heard of before, not that I know all teas now, but I had enough to find a love of my life, which needless to say, Dan Cong. 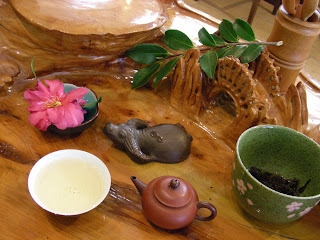 Through years of drinking, I heard many people refer a tea's characteristics as cha yun. Each tea has its yun, each location, region, mountain all have their yun reflected upon tea. How do we determine the term? From my understanding out of my experience, 2 things might be mixed when we speak of cha yun. 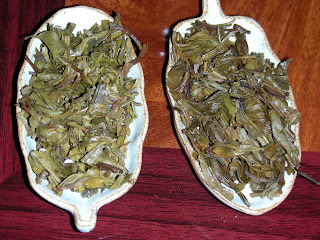 First is varietal flavor, Tie Guan Yin is distinctive from Dan Cong, Dan Cong is distinctive from Taiwan oolong. Roughly speaking, these are varietal flavors, not Cha Yun. Chicken will taste like chicken whether its free range or caged although one taste like good chicken and the other taste just like chicken. Second is the indescribable yun. What makes up cha Yun is the subtle characteristics which remind you of the place, the people and the happenings where you had the tea?! Yun is an up in the air term. Literally it means Rhyme, the ending of 2 phrases rhyme with each other. The music tones rhyme. It's a term to describe sound. When yun is used to describe human, it takes on a totally different meaning. Women have lady yun which girls don't. In this context, it means aura, character, charisma, personality. How can we describe cha yun? To me, it's how a tea makes you feel, the energy created in your body that reminds you of something consistently when drinking similar teas. 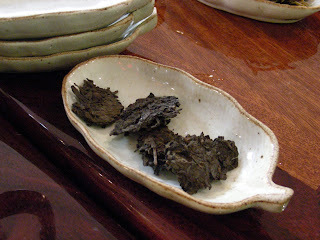 Aged pu-erh gives me a nourishing feel, grounded and protected. It's the aging effect I suppose. Like a father caring for his child. 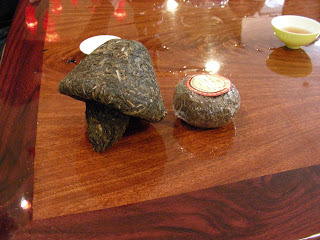 I associate pu-erh with a masculine energy, Wuyi rock tea also give me the male masculine energy. Dan Cong, reminds me of an out side world unlike any metropolis or even a country site. 世 外 桃 园 a peach garden out side of this world. The floral aroma will lighten your feet, lift your spirit off the ground, the honey taste is warm to the soul, leaving you worry free. Each person perceive things differently, and each tea effects every one differently as well. That's why cha yun will vary for each person. Ok, I lost sleep for 2 nights in a row after I found out I'll have the privilege to taste the $6000 / 500 g Dan Cong in June 2008, I can't contain my happiness and feel the need to brag a little. This makes me gitty just thinking about it. #1 bush on Wu Dong mountain, Jiang Mu Xiang - Ginger Mom Fragrance 姜母香. Tiny hong ni shui ping pot (30-40 ml) makes one perfect cup of tea. When drinking alone, I like using a small pot, so I get to finish every infusion before turning cold . Ah, if I didn't have to run a shop, this would be a pretty darn good and easy life. 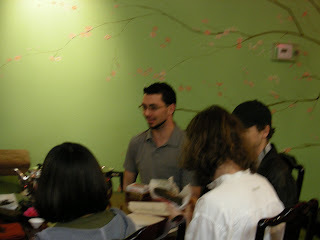 I am working on the long over due "Get to know Dan Cong 3", should have it ready in a day or so. Lew asked me a couple of weeks ago about the relationship between Wuyi and Dan Cong. As I mentioned in the last Dan Cong article , Phoenix Shui Xian and Wuyi Shui Xian are not related, not even the same concept. Phoenix Shui Xian is an over all group name of all local tea varietals on Phoenix Mountain range. Wuyi Shui Xian on the other hand is a single varietal among hundreds Wuyi rock teas. The question remained is Phoenix tea related to Wuyi rock tea? The answer is no as in direct relation, however as we all know all teas are descendants of pu-erh tea in Yunnan Province. So all teas are related, depending on how closely related they are. Yunnan large leaf arbor tea tree is mother of all Camellia Sinensis trees existing in the entire world. There is no doubt about that. Tea trees spreading out side of Yunnan like any plants are carried out by 3 carriers: humans, animals, and water/soil flow. Humans take plants with them when migrating, birds and animals consumed seeds from one place and dropped off at another, water and soil flows seeds and plants out of the region naturally. By any of the 3 means, tea plants travel closer to the original area would be closer related. Distance, climate change, local soils and condition all play major roles in how tea trees are transformed genetically. Yunnan large leaf arbor trees are closely related to arbor trees in Si Chuan, Guang Xi, and Guang Dong (phoenix teas). These are some of the oldest original tea trees on the planet. Chao Zhou being closed to Northern Fu Jian geographically, one must wonder if they come from the same mother trees. A few thousand years ago, this might be true, however after such long period time of mutation, they are now distinctive from each other. 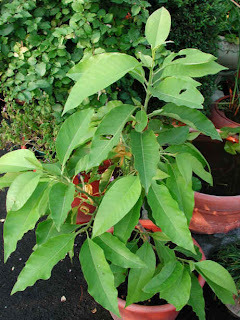 Phoenix teas are large leaf arbor trees. Wuyi rock teas are small to mid size shrubs. Out of all teas, Wuyi and Phoenix are the most alike by processing method and shape. Wuyi method was adopted by Chao Zhou locals in the last couple hundred years. Hence they are similar in shape, but not in flavor. Oolong method is a relatively new player in Chinese tea history. One of the oldest tea varietals grown wildly in Phoenix mountains is Hong Yin 红茵, believed to be the ancestor of Phoenix Shui Xian. Hong Yin are still wildly grown among the area, locals collect the leaves to age, aged Hong Yin is drinkable and mainly used for medicinal purpose. That's in line with the initial usage of tea a few thousand years ago. Articles from Tang's dynasty mentioned about tea in Chao Zhou region, hence it's fair to say Phoenix mountain has been producing tea for more than 1000 years. The mutation of tea trees takes upwards of hundreds years. A single varietal can mutate into many different flavor teas over time when propagate with seeds. Tea trees on Phoenix mountain are grown in natural habitats, among other trees and shrubs. Inter-pollination changes genetics of tea trees, over time, tea trees takes on aromas of natural flowers. The location, long term mutation and local climate made Phoenix tea unique as one varietal family, different from any other regions, including Wuyi Rock tea. Whether Hong Yin is mother of both Phoenix teas and Wuyi rock teas or they are just cousins, no one can verify at this time. Comparing old trees of similar age from both regions, I would think they are cousins. 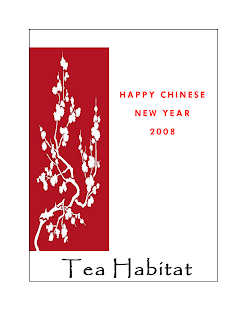 It takes lengthier time to transform an arbor tree into a shrub than where as phoenix teas stay as arbor trees. If they were from the same mother tree, both of them should either be arbor trees or both be shrubs.